Hide Drain Cover There are 3 products. The HIDE Multi Size Access Cover is a solution to concealing your exterior surface outlet. The cover is designed to be lined or filled with the surrounding surface material. This makes the access cover inconspicuous and virtually disappears.Inlay material is not included. The HIDE Drain Cover is a solution to concealing your exterior surface water drainage outlet. The cover is designed to be lined or filled with the surrounding surface material. 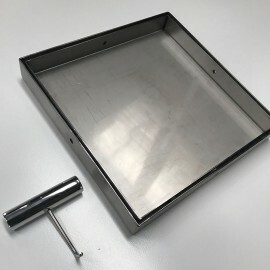 This makes the drain cover inconspicuous and virtually disappears.Inlay material is not included. 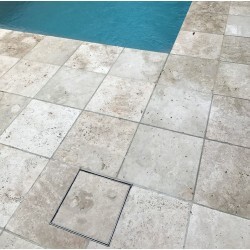 The HIDE Drain Cover is a solution to concealing your exterior surface water drainage outlet. The cover is designed to be lined or filled with the surrounding surface material. This makes the drain cover inconspicuous and virtually disappears.We cut & fit your own stone to a new tray.